Arthur Williams (sometimes named Arthur William Williams) was born in Church Lane, Old Headington on 4 September 1890. He was the son of Frederick William Williams (born in Headington in 1859 and baptised at St Andrew’s Church on 28 August) and Alice Morris (born in Headington in 1864 and baptised at Holy Trinity Church as Rebecca Alice Morris on 27 November). John William Williams (born in Highfield on 9 October 1906 and baptised at St Andrew’s	Church on 2 December). At the time of the 1891 census Arthur (wrong recorded as “Austin”) was a six-month-old baby living at St Andrew’s Road (then called Church Street) in Old Headington with his father Frederick (30), who was a mason's labourer, his mother Alice (26), and his sisters Rosa (3) and Emily Jane (2). Arthur’s grandfather Joseph Williams, a butcher in the Croft in Old Headington, died at the age of 74 and was buried at Headington Cemetery on 15 February 1894. At the time of the 1901 census Arthur (10) was at school (almost certainly Headington National School) and living in Old High Street with his father Frederick (41), who was now working as a cowman, his mother Alice (34), and his siblings Emily (12), Lily (8), Edith (6), Norah (3), and Frederick (four months). By 1911 the family had moved to Rose Cottage at the present 101 Lime Walk (formerly numbered 61), which had just been taken into the new parish of All Saints. Arthur (20), who was working as a butcher's assistant, was living there with his father Frederick (51), who was now a bricklayer's labourer, his mother Alice (46) and his sisters Edith (16) and Norah (13) who were working as dressmakers, and his brothers Frederick (10), Frank (7), and John (4). His other sister Lily Florence (19) was working as a servant at 59 Marlborough Road in south Oxford. In the First World War Arthur Williams served as a Private, first in the Queen’s Own Oxfordshire Hussars (Service No.14001) and then in the 20th Battalion (attached to 124th Trench Mortar Battery) of the Durham Light Infantry (Service No. 25962). He died of wounds in Belgium at the age of 27 on 29 July 1918. 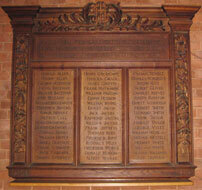 He is remembered on the Roll of Honour of All Saints’ Church, Highfield. A Frederick Williams continued to live at 101 Lime Walk until the 1940s, and this is probably Arthur’s father rather than his brother (despite the fact that only his mother is named on the CWGC information below), as in 1944 a Frederick Williams died at the London Road Hospital at the age of 85 and was buried at Headington Cemetery on 25 August. John William Williams (born 1906) may be the John W. Williams who married Olive M. Hughes in the Headington registration district in the fourth quarter of 1929. Arthur's other siblings vanish from the Headington area.